Puddles of Myself: Are You Afraid of the Mark? Making his second contribution in his weekly column (he and I will have to come up with a solid name for it), Mark Jack is here again to contribute a bit of intellectual prose for all of you to read. These are moments to enjoy a break from my writing beating you over the head with an agenda and to enjoy the words of an actual articulate person. I give you Mr. Jack. 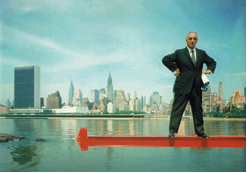 A city standing despite us or even in spite of us is a foolish conceit, or rather, yet another example of our inability to credit our constant author-ity, to recognize the little Robert Moses in all of us. 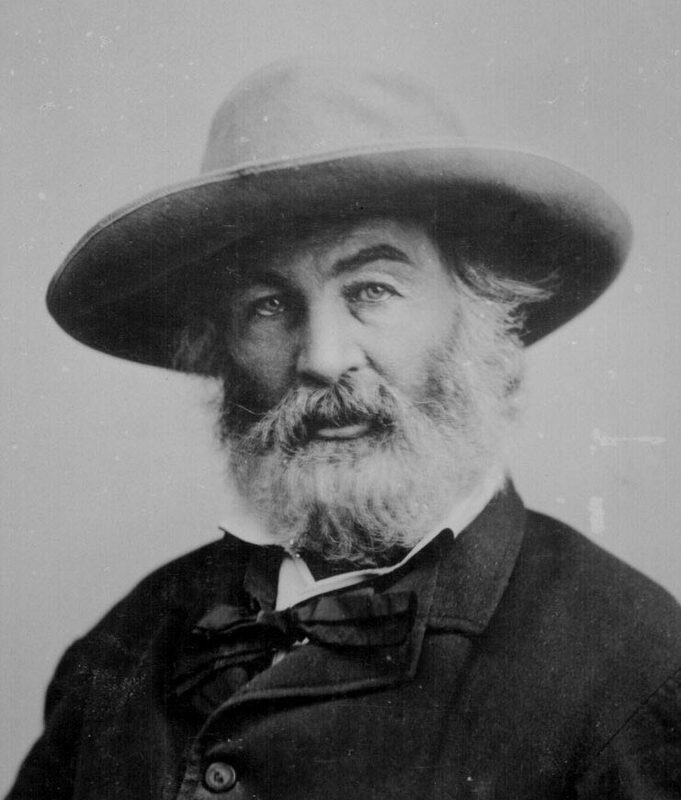 Still, I am surprised by the lives lived all around me, lived without any regard to me. The other day I was walking near my friend’s apartment in the Bushwick neighborhood of Brooklyn, making abrupt turns here and there, not really caring if I retraced my steps as long as I observed some difference on my second lap--usually I am horrified by the thought of retracing my steps, like, obsessively worried by the possibility of circumambulation. I made a right turn onto Bushwick Avenue and continued toward Queens. Across from me stood a ruined white church that looked like it belonged in some post-apocalyptic New England town. The steep roof, rotted over the years, and torn recently by high winds, barely supported a grey-green steeple. The roof and facade were "holed" more than holy and the whole building seemed...well, forlorn seems like the appropriate word, though I was hoping to avoid it. I continued along Bushwick, and made another right turn. Here, along a street the name of which I am sorry to say was never noted, were a series of elegantly appointed brownstones, complete with those giant hollow hand rails and enough wide steps to fit an army of flirting teenagers. Old trees lined the way and the condition of the entire block reminded me more of Fort Greene than an area of Bushwick otherwise filled with crumbling or crumbled sidewalks, empty lots, and not even a bodega on every corner. My surprise turned quickly to the realization that here was a neighborhood that existed almost in spite of what I, and the rest of New York too obsessed with proximity to Manhattan as the ultimate marker of convenience, had forgotten about. It is the trait that makes such a densely packed, hugely diverse city like this not only habitable but even fantastically so. This trait occurs when the inhabitants of this or any other city remember to treat their neighborhood like a town amidst other towns that, which are all scrunched together for convenience. It is when we recognize and appreciate this trait that we then begin to live somewhere instead of just sleeping there, which is something I find immensely important. I think this is something many people in my generation should remember. I refuse to believe that time has anything to do with it, though. I refuse to believe that growing up somewhere allows us to be part of a neighborhood and that not spending some part of our childhood years in a place permanently bars one from inclusion in a neighborhood. I reject the idea that our integration and friendly existence in a small town or large neighborhood in an even larger city has anything to do with the time spent there rather than simply our attitude toward it. I realize that perhaps what I felt on that street in Bushwick is not exactly coming through in my writing. I also realize that I don’t completely understand what I felt. I can say that I felt apart from the lives lived there. This is not to suggest that I felt like a foreigner or like some wary tourist, stumbled into an actual, habituated section of the city where the gift shop clerks live and wear the clothes they actually wear and eat the foods they actually eat. Rather, I felt beautifully separate. I had no clue as to what the people living on that street did for a living or if they cared about the disintegrating, waterlogged church, or, if they did, from what perspective. I felt as though I were some benign ghost, approving the lives lived simply because they were lived. Maybe this is an odd sentiment, but I don't think so. In any case, my walking observations found me dwelling on how a community is organized. More specifically, I was dwelling about the dynamics of a community diversely populated and totally made of scrap wood, and populated by plastic dolls. 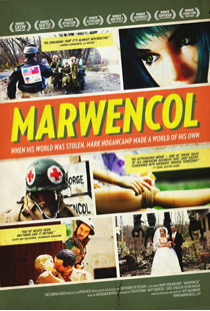 Last week, I went to the IFC Center and watched a documentary called Mawrencol. The movie is about Mark Hogencamp a man of rather slight--given the scope of the world’s odd behaviors--peculiarities, who, after being beaten into a nine day coma, emerged severely disabled and without enough money to last very long in rehabilitation. As a way to exercise his dexterity and his anger over the attack he began to create a fictional town in inanimate 1/6th size. The town is set in his yard in upstate New York or in Belgium during WWII, depending on what story line you think is more important. The town is really just a backdrop wherein Mark, the film’s subject and town’s creator can act out his frustrations and fantasies. The town’s origin story, as Mark spins it, contains all the best elements of a boy’s horny imagination. Mark, as a WWII era American fighter pilot, is shot down in Belgium just outside a small town where the SS have dispatched all the men and left only beautiful women, which are actually Barbies. Mark, as doll, sometimes referred to as "Little Hogie," wanders into town to the women’s delight and is given some property where he sets up a bar and everyone, including Allied and Axis soldiers get along, ‘cause everyone gets to drink and have a Barbie girlfriend. Well, actually, Mark gets them all, in a way. The documentary is very well done and, if nothing else, entertaining. I was fortunate enough to see it on the opening day and sat quietly after the movie as the audience asked, for the most part, rather intelligent questions of Mark, the director, and two other people important to both the film’s story line and Mark’s career as an artist. Mark’s artistry, however, as depicted in the film, exists tenuously. In the documentary, we are given a glimpse of Mark Hogencamp as a gifted but alcoholic doodler who resorts, for therapy, both physical and mental, to a fictional, doll filled world that also fulfills his artistic ambitions. In the last third of the film we see Mark nervously set off for the big city where he wanders nervously about an art gallery in the Village as people judge his enlarged photos of militarily posed and clothed dolls. His photographs are reasonably well shot, with a good sense of how to force perspective, but the shots are a little too action movie-esque to excite me and the exciting bits about him as damaged outsider artist feel slightly contrived. To be fair, the photos are clearly meant to be viewed as art. The man wants to be an artist, and wants his somewhat juvenile and unfocused stories to be played out as a movie - which is how he sees it in his head - with the photos as stills. In the end, it is an entertaining movie but I’m unsure as to how we are expected to treat the subject. Are we supposed to identify with him? Are we supposed to feel sorry for him? Does the director intend for us to treat Mark Hogencamp as a seriously talented artist? Unfortunately, I feel as though that is exactly what the film wants us to do but can never honestly do itself. The film constantly refuses to believe its own assertions and undermines “Mark-as-artist” constantly. He is only an interesting subject if he remains outside, so he must be viewed as “uncomfortable-as-artist,” and “awkward-as-social-being.” All that said, the movie is pretty great and you should see it. Where this all ends up is that the movie raised some serious questions about community involvement for me that had already been stirring around in my head on my walks around the borough in which I live. What I would’ve liked to see from the movie is more of a meditation on our own constant creation of the world around us. If the film implicated us, the audience, a little I think we could have benefited more from the movie. As it is, I’m worried that the movie will provide the viewer only with a justification of our smug belief that we love difference and art and totally believe in a dynamic human spirit but in that way which is obnoxious and misguided.